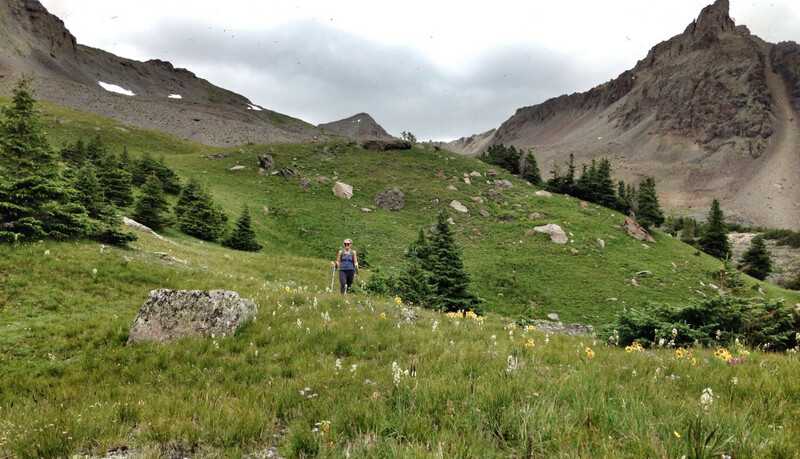 A hiker in the high country above Blue Lakes. A shorter option is just to the lower lake, 6.6 miles roundtrip. The trail climbs 3.3 miles and 1,600 feet to the lower lake, and kicks up from there, with stout climb to the upper lakes. The wildflowers of summer are spectacular, rivaled only by the golds and coppers of fall. 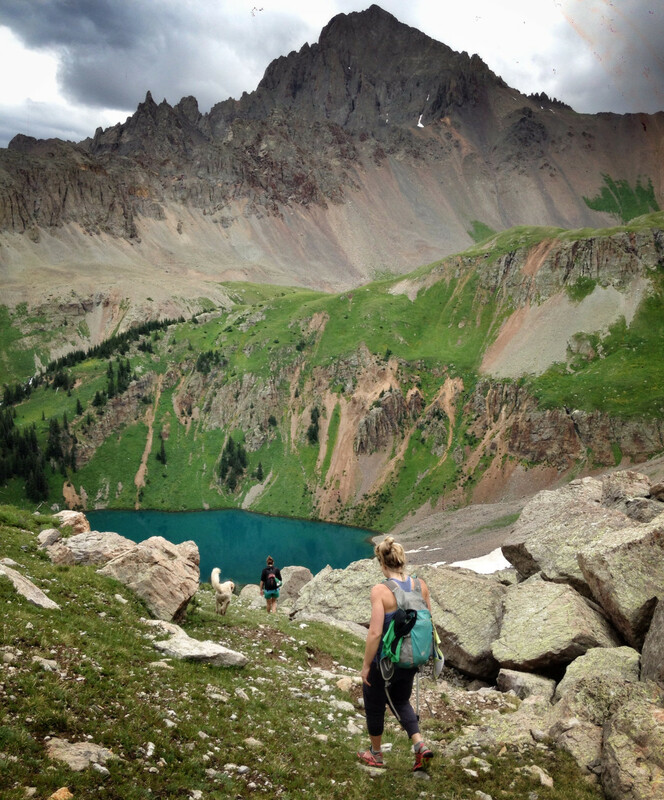 The Blue Lakes trail near Ridgway (not to be confused with Blue Lake, singular, closer to Telluride) is a great outing for hikers who enjoy the best the San Juan Mountains have to offer: meadows spangled with wildflowers, craggy ridgelines, dazzling alpine lakes and the chirp of pikas. The trail, a moderate climb that ascends through shady pine forests and lush fields of delphinium, begins at 9,400 feet and climbs to a chain of three eye-popping alpine lakes nestled in high basins near the flanks of Mt. Sneffels, Dallas Peak and Gilpin Peak. Depending on your mood, you can call it good at the lower lake, or go all the way to the upper lakes and pass at 13,000 feet. 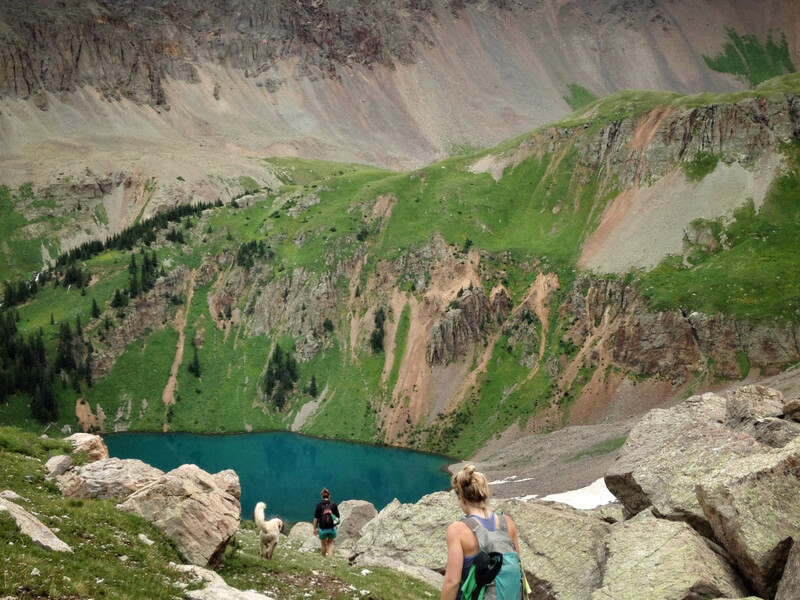 Blue Lakes has all of the components of a great summer jaunt — tiny creeks, wildflowers galore, a good bit of elevation gain and a gorgeous reward at the end of the trail: picture-perfect lakes and up-close views of rugged San Juan peaks. A great feature of this hike is the flexibility. You can choose your own adventure with the roughly 6.3-mile loop to the lower lake, the 8.2 mile-loop to the upper lakes, or for the really ambitious, the 11-mile loop to Blue Lakes Pass and back. Since all the options get hikers to the banks of lakes as blue-green as Caribbean waters, you can't really go wrong. Fit and efficient hikers could churn out this hike in a couple of hours, but it's best experienced with enough time to savor it. There's a stout climb, scree scrambling at the top and a lot of views to drink in. Not to mention wildflowers — if you hit it at the height, in July or August, you'll wade through everything from paintbrush to buttercups, bluebells, king's crown, columbine and asters. Take a field guide. Take a lunch. Take a swimsuit for a dip in the lake. Because there's nothing like a swim in icy alpine water to make you feel alive. This hike is great for trekkers who enjoy a bit of elevation gain, a good meander through the trees and classic alpine vistas. It begins at 9,400 feet and climbs into oxygen-thin terrain, so it's not recommended for beginners. Those wanting to go all the way to the upper lakes or beyond should be strong hikers with sturdy footwear. Hikers should bring layers, plenty of food and water, trekking poles if they prefer them and rain gear, especially during summer monsoon season. The hike is dog friendly. From Telluride, head west on Highway 145 and continue past Placerville to the T intersection. Take a right onto Highway 62 toward Ridgway, and drive about 18 miles to County Road 7, which is marked East Dallas Creek with a large sign on the right. Turn right, and in two miles bear right where it meats CR-7A. Continue about 7 miles on the dirt road to the trailhead, which is well-marked.